Lamar Advertising Company acquired Phoenix-based American Outdoor Advertising, entering the local market and adding 157 static and digital billboards in the Phoenix area. Baton Rouge, La.-based Lamar (NYSE:LAMR) operates in 200 markets across the U.S. and Canada. The company reported 2011 annual net revenues of $1.1 billion and a net income of $8.5 million. Lamar’s stock price jumped nearly 10 percent today to close at $29.58 per share. This acquisition will alter the competitive landscape of Phoenix billboard market, bringing a new player into the mix. American Outdoor Advertising was the largest independently owned outdoor billboard company in the state, according to the company’s website. Lamar Vice President and General Manager Christina Butler would not disclose what the company paid or the terms of the deal. “We basically wanted to jump into the market and to add Phoenix to our national market,” Butler said. 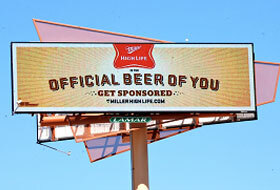 The company thinks the billboard locations acquired from the purchase sets them ahead of Phoenix competitors like Clear Channel Outdoor, CBS Outdoor and El Media Holdings’ Branded Cities. 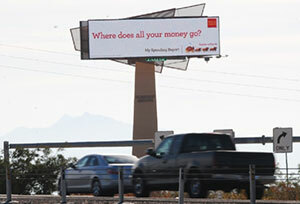 The new billboards include 30 digital displays on freeways across the Valley. 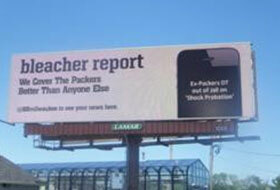 The company also added billboards around Arizona State University and next to University of Phoenix Stadium. “I think we will be highlighting the difference between our inventory and our competitors. We don’t have as much but we have better locations,” Butler said. In a separate deal earlier this week, Branded Cities Network, a division of Phoenix-based El Media Holdings USA, LLC, got rights to the world’s largest digital billboard in Las Vegas. The full motion LED structure is over 18,000 square feet, measuring 60 feet high by 308 feet wide. The original article appeared on the Phoenix Business Journal's website. Lamar Advertising Company is expanding its billboard inventory in Phoenix, Arizona, as part of its recent acquisition of American Outdoor Advertising. Sports fans have been playing an active role in determining the sports coverage displayed on digital billboards, thanks to a two-week interactive campaign from Baton Rouge-based Lamar Advertising, New York-based ADstruc and Bleacher Report.